Namco Museum will transport gamers back to the 80’s, a time when there was no finer way to spend your Saturday afternoons than going to the local arcade with your mates and a bag of 10p coins. Sadly, those times are gone but come summer, thanks to the Bandai Namco and Nintendo Switch, we will be able to relive those days once more and play classic arcade hits including Pac Man, Dig Dug, Galaga, Galaga ‘88, The Tower of Druaga, Rolling Thunder, Rolling Thunder 2, SkyKid, Splatterhouse and Tank Force. This collection of classics will include a challenge mode that offers players new and unique challenges for each game and unlike the arcades it will also allow you to pause and resume your game whenever you want. With Namco Museum players will be able to compete with their friends and other players around the world to earn the number one spot on the worldwide challenger board on any game in the compilation. 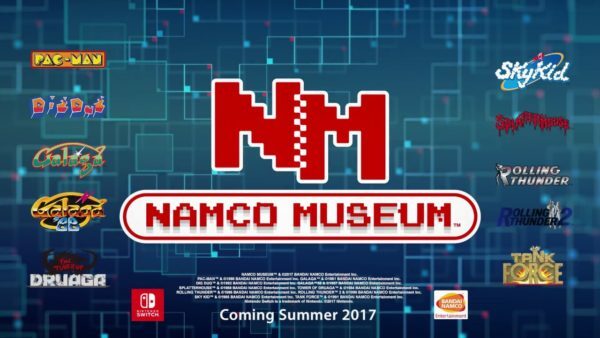 Look out for Namco Museum coming this summer with all you coin-op favourites.